When it comes to cooking, a wood fire is about as old school as it gets. BioLite has brought the basic wood fire into the 21st century with their CampStove. Why would I be interested in wood as a cooking fuel? My little motorhome has a fully equipped kitchen including a four-burner gas stove, but sometimes it’s just nice to cook outside. It also doesn’t hurt to be prepared for anything. While BioLite’s target customer probably camps somewhat more primitively than I do, why would they even be interested? Compact gas and liquid fueled stoves are abundant, convenient, and reliable. I’d like to think that, for at least some, there is a simple romantic or nostalgic attraction to a wood fire, but there are other good reasons, too. How about not having to carry fuel and empty fuel containers? How about wood being a naturally renewable resource? Oh, and how about if, on top of all that, it could recharge your phone or other devices while it cooks your food? Oh yeah. This is about as high-tech as cooking on wood gets. It uses forced ventilation for efficient burning, reduced emissions, and a really hot flame. And while there are other fan-driven wood camping stoves on the market, they all require batteries to run the fan, and that means batteries to remember and replace. The BioLite uses thermoelectric technology – the heat from the fire is converted to electricity to power the fan. Not only that, but it generates more electricity than it needs for its fan, and makes the surplus available via a USB jack so you can charge your phone, LED light, or other gadgets. Pretty neat, huh? I first read about this sometime last year and just had to get my hands on one. At the time they were still in development, but they were taking email addresses of interested parties. I signed up and eventually forgot all about it until one day, out of the blue, I get an email telling me they’re accepting reservations for preorders. Eventually I was invited to place an actual order, which finally shipped last week and arrived this week! I was impressed from the moment the UPS driver handed me the box. Much smaller than I was expecting. The box, that is. It was exactly the size it needed to be, but not a millimeter larger in any dimension. And no polystyrene peanuts nor plastic bags, either. BioLite gets extra points in my book for smart eco-friendly packaging. In the box was the stove (in a drawstring nylon stuff sack), a short USB cable (for initial charge-up of the internal battery), a handful of sawdust-and-wax fire starters in a waxed paper bag, and a sheet of instructions. The stove is very well built. Excellent fit and finish. The “power module” (orange unit containing the fan and electronics) stores inside the fuel chamber. For use it attaches to the side of the fuel chamber and is securely held by extending the legs, one of which engages with a protrusion on the bottom of the power module. I connected the power module, using the supplied USB jumper, to an AC powered charger to “condition” the battery prior to initial use. This is only necessary the first time, or if the stove is stored for more than six months. The BioLite burns wood or other biomass, so I went about collecting some. It didn’t take long to collect a handful of twigs, plus some bark and pine cones fallen from nearby trees. I collected a variety from smaller than pencil thickness up to about as thick as my thumb. I broke them into about 5-inch lengths. I attached the power module to the side of the stove and deployed the legs. I loosely filled the fuel chamber with a few pieces of bark and the smallest of the twigs. I twisted a bit of newspaper up into a “stick” of sorts and stuffed it in. I lit the paper with a long barbecue style butane lighter, sticking it down to the bottom to get the bottom of the paper and some of the bark burning as well. Once it looked like it was burning well enough, I started the fan (doing it too soon would just blow out the flame), and after another minute or two, it was going quite nicely, so I added a couple pine cones and some of the thicker twigs. I switched the fan to high and put on a pot of water. While waiting for the water to boil, I watched for the LED bar above the USB jack to turn green, indicating that it was ready to use as a charger. I connected my combination cellphone and UHF/VHF radio and sure enough, the phone’s display indicated it was taking a charge. I was using fire to charge my HT/phone — how cool is that? I probably should have started a timer, but it wasn’t three minutes before the water started to bubble a bit, and in less than five it had achieved a vigorous boil. During that time I had to lift the pot once and feed the fire. I made myself a nice cup of tea and took some photos. In all, I’m very pleased. I can honestly say the BioLite CampStove has exceeded my expectations. It’s a great little stove; burns hot and clean on a handful of twigs. It’s so efficient that it only left a couple of tablespoons of ash. I can also see it being really nice as a compact portable (tabletop, even?) campfire. I don’t know how often I’ll have a need for the USB charging feature, but it never hurts to have a backup plan. It might work nicely to directly power a small LED light — maybe to see what I’m cooking at night? Oh, and what’s more, BioLite is using sales of the CampStove to help fund the design and construction of a larger version for use in developing nations. For more info or to get your own CampStove, check out BioLiteStove.com. Charging Time 20 minutes of charging provides 60 minutes of talk time. Charging times vary by device and by strength of fire. Just a quick note to remind you that today is Pi Day, and to call your attention to the fact that this blog is now located at homelessonwheels.com. Enjoy a yummy pie as you update your your bookmarks and links. My car has been acting up lately. I know what it needs and already have the part (water pump). Unfortunately, it has been lethally hot outside for the past few weeks. We’ve been under excessive heat advisory for over two weeks now, with 115-120 degree temperatures. I even saw a 122 degrees on my thermometer the other day. The heat has probably contributed to my recent lack of productivity here in the written world. Needless to say, it’s not conducive to being outside doing car repairs either. The car is not completely disabled; I can drive it 5-10 miles at a time without a problem, but I don’t trust it for a 50 mile round trip to the supermarket. What better time, I thought, to try online grocery shopping. With gas prices continuing to rise, perhaps it might be a viable option, especially if I factor in the two hours it takes to go, shop, and return. Not to mention the temptation for impulse shopping. Internet grocery shopping would be a good exercise in discipline, too, forcing me to carefully make a list and stick to it without opportunity for cheating. Where could I do this internet shopping? If I lived in the Phoenix metro area, Safeway would deliver to me. Not out here, though. It seems most decent sized cities have at least one grocery store or service that offers home delivery. Heck, if I lived in the city, I’d probably be within a mile or two of a supermarket and quite possibly within easy walking distance. I wouldn’t need delivery. The two biggest internet grocers, Peapod and Netgrocer, were of little help to me. Peapod only serves northeastern states. Netgrocer will ship anywhere, but unless you are very close (again, the northeast US) shipping rates become prohibitive. And of course, no dairy, meat, or fresh produce, either, outside of their local service area. What other options? Amazon has a pretty good selection of non-perishables, and the prices aren’t too bad, but it seems you have to buy everything in minimum quantities of six (or more). I don’t have room to store six of everything. And they don’t do meat, dairy, or produce. I found another place — Groceries Express — with slightly better prices than Netgrocer, more reasonable shipping rates, and they even had some refrigerated items on their site. I decided to give it a try. I chose a small assortment of items that I needed: a bag of whole-bean coffee, hard salami, a couple of kinds of crackers, a jar of olives, and paper towels. I also wanted to see how they handled refrigerated items, so I ordered a couple different kinds of cheese as well as a jar of Claussen pickles. I ordered on a Friday afternoon, expecting the order would be filled and shipped the following Monday. While my order’s status changed to “pulling from warehouse” on Monday, it didn’t actually ship until Tuesday evening. It arrived in Phoenix that Friday, where it sat in a warehouse over the weekend until it was delivered to me on Monday. The large red “refrigerate on arrival” label on the box was promising. I opened the box, and found the contents to be efficiently packed. One of the two glass jars was wrapped in a sheet of foam, and the other in some sort of paper-based pad. There was no broken glass, but there was a definite pickle odor. The paper-wrapped jar was the Claussen pickles. They apparently were leaking from around the lid seal. Luckily the paper padding had absorbed the relatively small bit of liquid, preventing damage to the other contents. More importantly, no attempt was made to keep the pickles cold (Claussen pickles are made cold, never boiled, and therefore must remain refrigerated for safety as well as quality). The cloudiness of the usually clear liquid told me they were spoiled and would be both undesirable and unsafe to eat. Two plastic pouches claiming to contain cheese enclosed two oily globs of matter — one yellow and the other orange. Even the crackers were mostly broken (and the saltines tasted like cardboard — the manufacturer’s fault, not the vendor’s), so all I had left for my $80 and over a week’s wait was coffee, salami, paper towels, and a small jar of olives. Needless to say I was not pleased. Their mishandling of the refrigerated items, especially since their availability was the reason I chose this company, is inexcusable. Back to the drawing board. I guess internet grocery shopping isn’t designed for those of us who could really benefit. Perhaps there is still a way I can do my grocery shopping with a minimum of driving. Maybe, using a combination of sources, I can meet my culinary needs without having to stray too far. While the nearest real supermarket is 25 miles away, might there be a closer option? I have my choice of three convenience stores right up the street, all with an equally overpriced and virtually nonexistent selection of actual groceries. But there’s a small General Store about seven miles away that I recall had a slightly better selection and somewhat lower prices. Worth a look-see. It turns out that they have enough of a selection to survive on, if one isn’t too picky. Canned meats and fish, some basic fresh produce (I saw bell peppers, lettuce, cabbage, celery, onions, and potatoes, as well as common fruits), frozen veggies, basic dairy (milk, butter, eggs, and cheese), and plenty of boxed, canned, and jarred goods. I can continue this minimal-driving grocery shopping experiment by purchasing as much as I can at this relatively close general store. It will let me reduce my driving while also allowing me to spend my money closer to home. Some of the slightly more exotic (at least by rural standards) items like whole-bean coffee, herbal teas, and “raw” sugar I’ll have to buy online and have shipped. I might even indulge myself with an occasional trip to the real supermarket. Schwan’s could be an option, too, for some items. In addition to the ice cream they are well-known for, they also deliver an assortment of frozen foods. Mostly ready-to-microwave entrées and meals, but they do have frozen meats, vegetables, and ready-to-bake bread too. And they even deliver here in my area. If any of you have any experience with internet grocery shopping or other food delivery services, good or bad, I’d love to read about them in the comments. I had a successful grocery shopping trip today. I took a written shopping list with me, and stuck to it. Well, I actually did buy two additional things, but they were not impulse buys — they were needed items that I’d forgotten to write down, and was reminded when I saw them in the store. I even added them to the list before actually picking them up, just to make it official. Maybe the most noteworthy part of the outing occurred before I did my grocery shopping. Since it’s a bad idea to grocery shop on an empty stomach, especially when trying to avoid impulse buying, I decided to have lunch first. I stopped at KFC. Perhaps not the healthiest choice, but hey, I could do worse than chicken. “Honey Sauce” and “Buttery Spread” according to the packets. 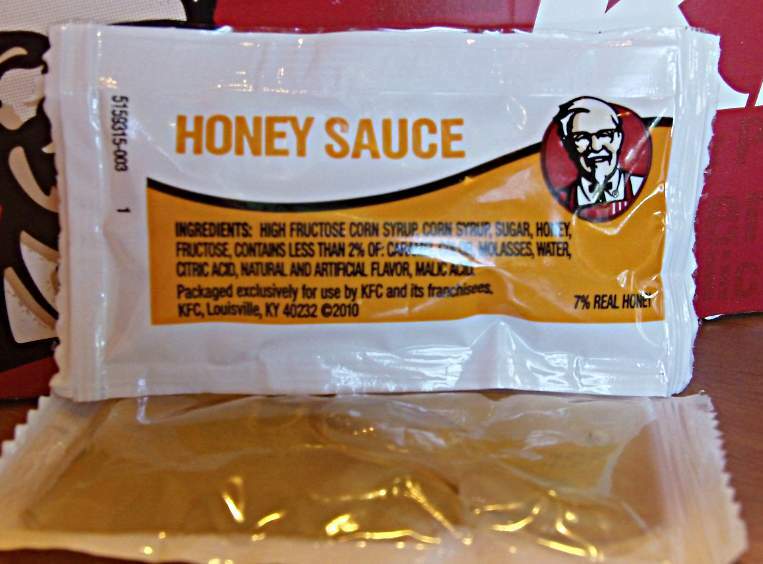 Click the thumbnails for a look at the fine print and you’ll see that the first three ingredients in “Honey Sauce” are high fructose corn syrup, corn syrup, and sugar. Oh, there’s a teensy bit of honey in there somewhere — “7% real honey” the package brags. 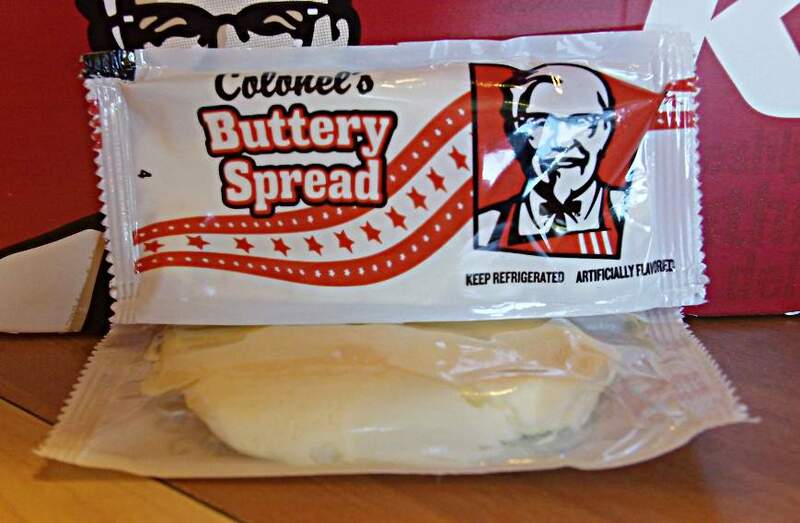 As for the “Buttery Spread”, who knows what’s in it. Probably no butter. Lacking an ingredient list, the only clue is “artificially flavored”. I’m guessing whipped vegetable oil and fake butter flavor. I suppose fake butter is nothing new, but fake honey? I guess that’s one more reason to eat at home. At least I have honey and butter. The real kind, that comes from bees and cows. When I was deciding what to take and what to leave, I’d opted to leave my cast iron cookware behind (in the interest of saving space and weight). Not that I was gonna try and cook on some cheapie thin “camping” or “RV” cookware – I brought along a few pieces of quality stainless plus some heavy non-stick-coated aluminum. Who was I fooling? NOTHING else cooks like cast iron. Especially breakfast foods like bacon, sausage, eggs, and pancakes. Sure… a non-stick aluminum skillet or griddle will work, sort of. But they tend not to be as non-stick as they purport, and, especially with the eggs and pancakes, they just don’t brown the same nor taste the same as when cooked on well-seasoned cast iron. 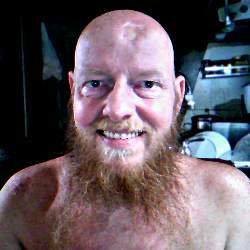 Well, I now have my Lodge skillet and griddle on board, and tossed out the Teflon-on-aluminum skillet and griddle, and I’m once again a “happy camper”. And yes, I said “Lodge”. Those who know me well know I’m not a brand name snob nor a name dropper, but once in a while there is a product or brand that stands out so far above the rest that even I will call it by name and will go out of my way to buy that brand and only that brand. Lodge, being the last remaining manufacturer in the USA of cast iron cookware, which is both reasonably priced and of excellent quality, deserves such name-brand recognition, even from a die-hard generic consumer such as myself. So life is once again good, mealtime is good, cooking (and eating) is once again a joy, even if the motorhome (and eventually myself) winds up being a few pounds heavier for it. Now where’d I put that cornbread recipe?